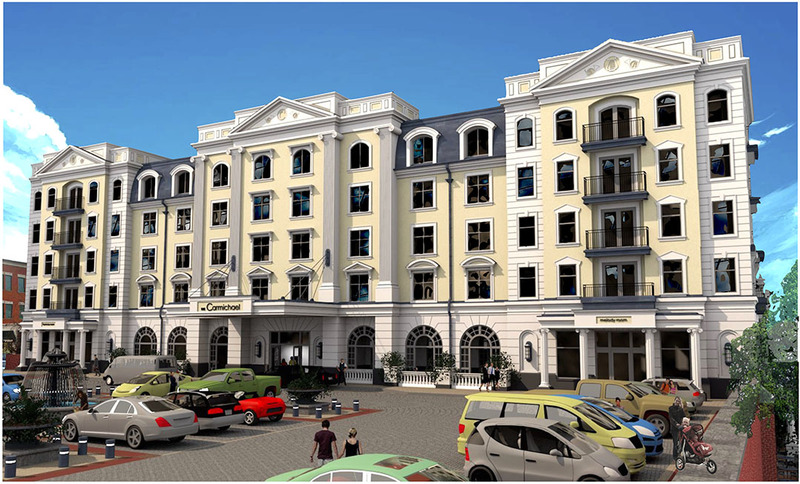 As the skeleton of Carmel’s luxury hotel begins to take shape across from the Palladium, the city has not closed on its portion of financing for the project, instead using Carmel Redevelopment Commission funds to cover the $1 million it has spent on the project so far. The city expects to close on financing to fund its portion of the project in early April, although it has had a financing agreement in place since last fall, Clerk-Treasurer Christine Pauley said. City officials declined to disclose terms of the financing because it hasn’t closed yet, but Mayor Jim Brainard said the delay was intentional and will benefit taxpayers. City spokesman Dan McFeely said the CRC has saved “thousands of dollars” by waiting to close on the financing, but he did not specify an amount. He also said waiting to finalize the financing has always been part of the plan to pay for the hotel and that no other projects have been affected or delayed by the hotel timeline. The $40 million Hotel Carmichael is a public private partnership between the city and developer Pedcor. The Carmel City Council approved $96 million in bonds to fund the hotel and other projects in September 2017, with $18 million designated for the hotel. Pedcor contributed the land for the hotel and is responsible for the remaining construction costs. Pauley, whose duties include processing city expenditures, said she has several concerns about the city delaying financing of the hotel. She said CRC Executive Director Henry Mestetsky and Brainard have “taken advantage” of the CRC and city council approval of the hotel financing, which did not include a final date for bond closure. He also said that taxpayers may be able to argue that their taxes are too high if a city has these kinds of funds available to use to hold off interest payments. Brainard said that commercial loans are complex and “never easy to close” but that he expects this one to be finalized soon. The five-story hotel is expected to open May 1, 2020.